From the books and heretics burnt on the pyres of the Inquisition to self-immolations at protest rallies, from the massive burning of oil on the global scale to inflammatory speech, from the imagery of revolutionary sparks ready to ignite the spirits of the oppressed to car bombings in the Middle East, fire proves to be an indispensable element of the political. To account for this elemental source of heat and light, Pyropolitics delineates a semantico-discursive field, replete with the literal and metaphorical mentions and uses of fires, flames, sparks, immolations, incinerations, and burning in political theory and practices. 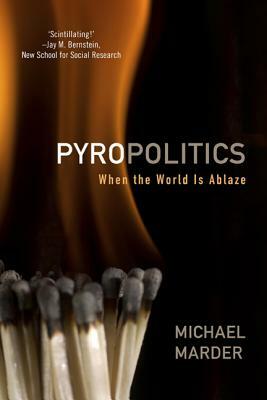 Relying on classical political theory, literature, theology, contemporary philosophy, and an analysis of current events, Michael Marder argues that geo-politics, or the politics of the Earth, has always had an unstable, at once shadowy and blinding, underside--pyropolitics, or the politics of fire. If this obscure double of geopolitics is, increasingly, dictating the rules of the game today, then it is crucial to learn to speak its language, to discern its manifestations, and to project where our world ablaze is heading. Michael Marder is IKERBASQUE Research Professor in the Department of Philosophy at the University of the Basque Country, Spain. He is an editorial associate of the journal Telos and has written numerous books and articles on phenomenology, political philosophy and environmental thought. His recent book publications include Plant-Thinking, 2013, The Philosopher's Plant, 2014and Phenomena-Critique-Logos, 2014.